When people think of Eagle River, different images pop into their minds. It's the Snowmobile Capitol of the World, home to the Labatt Blue Pond Hockey Championships, but to most, Eagle River's claim to fame is it's Chain of Lakes, 28 interconnected lakes--the largest in the world. 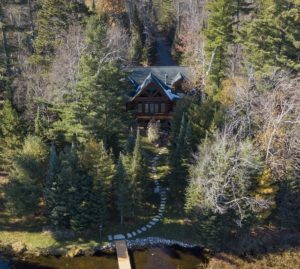 It's no surprise that many people dream of a lake property in Eagle River, often on the Chain of Lakes itself. The Chain of Lakes is extremely popular and the 10 lakes included on the Eagle River side of the Chain are considered "destination" lakes. There are 15 bars and restaurants on the Chain and boaters enjoy trying out all the options. All boats and water crafts are permitted on the Chain. However, there are lesser known, smaller lakes that may appeal to other people seeking lake property in Eagle River. In Wisconsin, lakes smaller than 50 acres are non-motorized lakes. These are perfect for fishing on quiet afternoons, swimming, or kayaking. In fact, most of the lakes in Eagle River have distinct personalities based on water clarity, shoreline, elevation, and a number of other qualities. At Coldwell Banker Mulleady REALTORS®, we know the territory well and can guide you to the lake property in Eagle River that suits your needs. Regardless of the lake you select, everyone loves a lake home with a beautiful water view! Start your lake property search! If you already know what lake you would like to live near in Eagle River, we can help you right away. On our website, you can search for properties not only by city, MLS#, or street name...but also by Lake Name or Lake Chain! If you're considering purchasing a lake property in Eagle River, Rhinelander, Minocqua, Manitowish Waters, St. German, Boulder Junction, Land O'Lakes, or any area in the Northwoods, give us a call. We'd love to show you around!